User interface: Input validation is improved in the date and calendar controls. User interface: Window transparency is supported, including both color keying and alpha blending transparency. User interface: All window rendering is done on the client-side using the DIB engine (except for OpenGL rendering). X11 driver: XRandR versions 1.2 and 1.3 are supported. X11 driver: X11 server-side font rendering is no longer supported. All fonts are rendered client-side using FreeType. Graphics: OpenGL rendering is supported in device-independent bitmaps using libOSMesa. Graphics: Path gradients are implemented in GdiPlus. Graphics: More image codecs features are implemented, including JPEG encoding, palette formats, and meta-data support for various image types. Text and fonts: Bi-directional text support is improved in the RichEdit control. Text and fonts: Built-in fonts are more complete, with the addition of FixedSys and Wingdings fonts, more high-resolution pixel fonts, and a wider range of glyphs in the existing fonts, notably Arabic glyphs in Tahoma. Text and fonts: Dynamic loading of scalable font resources is supported. Input devices: There is a joystick applet in the control panel, to allow configuring joysticks and testing their behavior. Input devices: The raw input API is supported for keyboard and mouse input. Kernel: File times are reported with nanosecond resolution. Kernel: Wine can be configured to report the Windows version as 'Windows 8'. Kernel: A monotonic time counter is used on platforms that support it, to make timers more robust against system time changes. Kernel: DOSBox is tried first when running a DOS application. The Wine DOS support is only used as a fallback when DOSBox cannot be found, and will be removed in a future release. .NET support: The Mono runtime is packaged as an MSI file, and its installation can be managed from the "Add/Remove Programs" control panel. 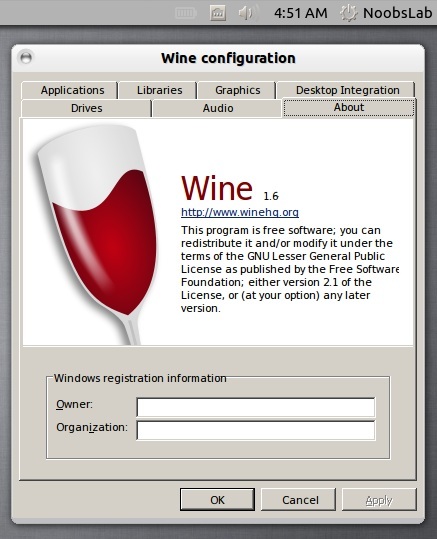 It is automatically installed on Wine prefix updates. .NET support: .NET mixed mode assemblies are supported. .NET support: The Microsoft .NET 4.0 runtime can be installed for cases where Mono is not good enough yet. Internet and networking: HTTPS connections use GnuTLS. OpenSSL is no longer used. Internet and networking: The TLS 1.1 and TLS 1.2 protocols are enabled by default, with automatic fallback to TLS 1.0. The SSL2 protocol is disabled by default. Internet and networking: Security certificate validation errors are handled better. Internet and networking: ActiveX controls can be downloaded and installed automatically. Internet and networking: NTLM and Negotiate authentication protocols are supported. Audio and video: DirectSound has a better resampler. Audio and video: Audio device enumeration is improved, and multi-channel devices are better supported. Audio and video: VMR-9 video rendering is implemented. Printer support: The PPD files of already installed printers are automatically refreshed when needed. Printer support: Printing resolution can be configured from the print dialog. Complete list of changes Wine 1.6 version. You can download source of Wine 1.6 for other Distributions from Source Forge.